I’ve also fixed other errors in BundlerMatcher too (small memory leak + no more 4096 match limit), so you should download this version too even if the previous version was working on your system. The new version is available on his dedicated page: please do not make direct link to the zip file but to this page so people downloading will always get the latest version. This viewer is now integrated with the new version of my PhotoSynthToolkit (v5). 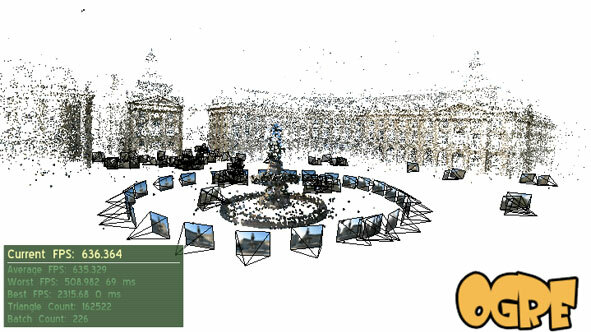 This toolkit allow you to download synth point cloud and thumbnails pictures. You can also densify the sparse point cloud generated by PhotoSynth using PMVS2 and then create great accurate mesh using MeshLab. Warning: the PhotoSynth viewer may need a very powerful GPU (depending on the synth complexity: point cloud size and number of thumbnails). I’ve currently tested a scene with 820 pictures and 900k vertices on a Nvidia 8800 GTX with 768mo and it was working at 25fps (75fps with a 470 GTX and 1280mo). I wish I could have used Microsoft Seadragon . The PhotoSynthToolkit v5 is available on his dedicated page, please do not make direct link to the zip file but to this page instead. So people willing to download the toolkit will always get the latest version. Masks with the PhotoSynth Toolkit 4 – tutorial from Josh Harle on Vimeo. I also have learned GPGPU programming by myself while coding a partial GPUSurf implementation based on Nico Cornelis paper. But this implementation is not complete and I’m willing to rewrite it with a GPGPU framework based on OpenGL and CG only (not Ogre3D). With such a framework writing Sift/Surf detector should be easier and more efficient.